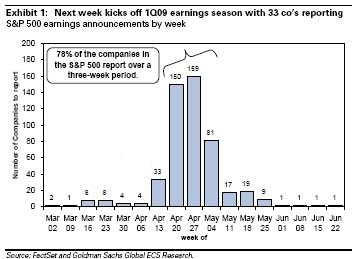 We are about to enter the heaviest weeks of earnings season, with some nasty surprises, so buckle up! The weekly AAII sentiment survey reflects 36% as bears (a decline of -8% points from last week) and 44% bulls (a rise of 8% points). Not surprisingly, the rally is continuing to send positive ripples through retail traders. ChartCraft’s Investors Intelligence survey of stock newsletter editors this week shows the most bullish posture since the start of this bear market (that is, assuming we’re still in it). With this week’s results, the optimists outnumber the pessimists for the the first time since January 2nd, 2009. Previous to that, it was in mid August 2008 and before that, a period of time from mid April to June 2008. All of those times coincide with market tops. According to the Hulbert Stock Newsletter Sentiment Index (HSNSI), which measures sentiment among short-term market timing newsletter editors, while the market has spent the past 2 weeks treading water, newsletter editors are much more bullish. Two weeks ago they were suggesting to their readers an average long position of only 8.8% but now, that’s jumped almost 18% points to 26.5%. It isn’t the nominal value of the sentiment but the fact that there has been a remarkable increase in bullishness with no real market movement to provide a rational cause for it. It wasn’t that long ago when the National Federation of Independent Business (NFIB) Small Business Optimism Index fell to a new low. In April it once again set a record, falling to 81. Small businesses across America are continuing to retrench - no green shoots in sight! Earlier in the week I outlined how the option traders are pushing their luck. Follow that link to get more details. During the rest of the week they continued to press their luck. The ISE sentiment index, tracking the retail options trader spent 3 consecutive days above 200 - meaning that they bought twice as many calls to open a trade as puts this week. The last time that we saw this many consecutive days of bullishness was in late December 2007 when the S&P 500 was trading at ~1475. The last time before that when the ISE sentiment index hovered over the 200 level for 3 or more consecutive days was in late October 2007 - when the market had just begun this brutal bear market. With odds like that, the rally is on very weak legs. In confirmation, the CBOE put call ratio continues to hover around the mid-point (equity only data). This ratio ended the week at 0.56 - meaning that the option traders were buying almost twice as many calls to puts. Similar to the twitchy Rydex market timers, who are all of a sudden very bullish now, the typical US equity mutual fund buyer has finally returned to the market. Early fund flow data for the short term, weekly data, indicates that we are seeing tentative but clearly net positive inflows into US equity mutual funds. Of course, we can’t play a contrarian at all times. The stock market needs this capital injection - especially considering the gargantuan amount of scared money sitting on the sideline. But in the past, whenever these market participants have peeked out from under their covers and dared to re-enter the market, they’ve had their head handed to them. The most recent example was the new year top (January 2009). Although it slipped mention, the National Association of Active Investment Managers (NAAIM) sentiment survey was an emaciated 2.15 on March 4th, 2009, just days before the launch of this latest rally. 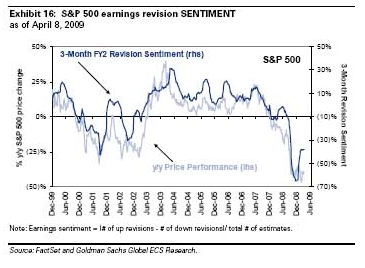 Although I didn’t mention it at the time, I’m not sure if it is meaningful because in the short history of this sentiment indicator, there are two weeks with a more bearish outlook: July 9th, 2008 (2.03) and October 8th, 2008 (-2.97) and neither of them really resulted in much of a rally. In July, the S&P 500 went sideways and eventually wilted and in October the market thrashed about but quickly melted even lower. While I continue to monitor lesser known indicators like the AAIM, I’m not totally convinced that it has proven itself to deserve our full attention. Once in a blue moon, Elliott Wave opens up their subscription walls and for just a few days, you can download 120 pages chock full of the most recent trading ideas covering the US, European and Asian markets as well as interest rates, commodities, currencies and much more. This is the most recent edition of their comprehensive Global Market Perspective. If you delay you’ll miss the chance because only during a brief window of opportunity are they giving you real-time access for FREE. There is no obligation to pay. No credit card needed, etc. All you have to do is sign-up with a valid email and in 10 seconds, you’ve got the same access as the regular paying clients of Elliott Wave and you’re downloading 120 pages of weekend reading. If you’ve got a pulse and you’re interested in trading, you can’t miss this opportunity. Babak, would you agree that as corporate earnings were slightly better than expected this past week, next week should be more of the same, with some relief and the rally continuing?